The European Patients’ Forum (EPF) is an umbrella organization of 74 patient organizations that works with patients’ groups in public health and health advocacy across Europe. EPF members represent specific chronic disease groups at EU level or are national coalitions of patients. EPF vision is that all patients with chronic and/or lifelong conditions in the EU have access to high quality, patient-centered equitable health and social care. EPF mission is to ensure that the patients’ community drives policies and programs that affect patients’ lives to bring changes empowering them to be equal citizens in the EU. EPF helps to empower patients’ organizations through educational seminars, policy initiatives and projects. EPF coordinate best practice exchanges between patient organizations at European and national levels and the programs also help to strengthen their organizational and advocacy capacity. Patients and the patient community are called upon to play a new and different role than in the past. EPF is key actor and contributor to build future health systems that are patient-centered, high quality and sustainable. EPF worked closely with the EU Institutions in the process of drafting the new legislation to ensure it was patient-centered. Cooperation between EAMDA and EPF is a very important to us as organization. 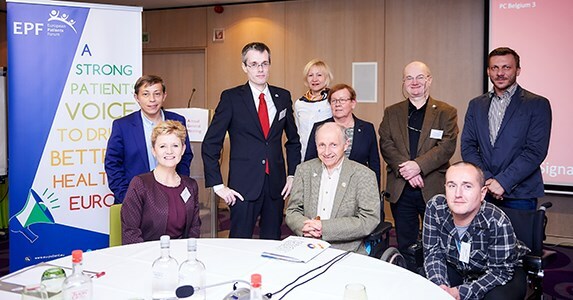 The strong patient organization as EPF is we can promote and help with the work and contribute to raise more awareness on rare disease as Muscular dystrophy is and keep the open dialogue between all stakeholders in healthcare.